I’ve been a conference “junkie” ever since I became a teacher librarian. I love the the energy, the mega dose of learning and inspiration I can take back to my library and school, the chance to see and network with old friends and meet new ones, and the fun at every conference I attend. And, AASL’s conferences are definitely second to none! But my conference experiences got even better, taking on a whole new dimension of networking, information, ideas, and, yes, even more fun, when I started using social media as part of my attendance. My platform of choice is Twitter because it carries the most quick information instantly and is always the most active platform at a conference. But if you prefer Facebook or Instagram, you can follow the conference on those as well. 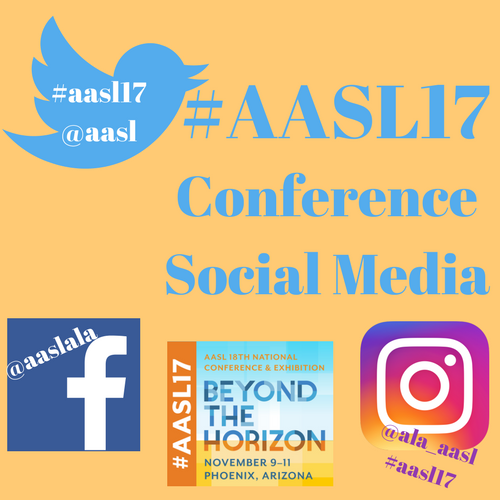 You can find the AASL page on Facebook by searching for either @aaslala or American Association of School Librarians. Read the posts and add your own there. On Instagram, follow AASL’s account at ala_aasl, and find and post to the #AASL17 hashtag. Please reference both @ala_aasl and when you post. So, join in now. Make your conference experience richer with social media! You will do a service to those who can’t attend the conference or who aren’t at a given session by sharing information, takeaways, links, photos, and more. You might even win one of our daily contests for the best posts; stand by for another blog post next month about those! And, if you want to play a key role in making this conference’s social media richer, consider joining the Social Media Squad. Get information, and sign up here: bit.ly/aasl17smsquad. Finally, here’s one of those shameless self-promotions: If you want to come up to speed on using Twitter while you are at the conference, consider attending the session Katie McNamara and I are presenting on “Build Your Own and Your Students’ Global Personal Learning Networks with Twitter” on Friday, November 10, at 10:10am.